Camp Varsity is a full day sports camp during the summer located at Watson B. Duncan Middle School. This camp is action-packed, combining a mix of team sports with fishing and fun recreational games. 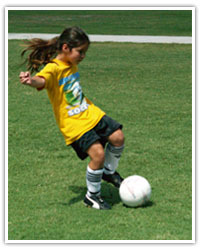 Camp Varsity focuses on sportsmanship and teamwork as well as developing new sports skills. Our camps have a different sports theme every week. No matter the theme or week, campers will have the option to participate in many different sports and recreational games throughout the week. Sports included every week are basketball, soccer, baseball, football, kickball, fishing, golf, recreational games, and more. Most camp activities are indoors with 2-3 hours max daily for outdoor activities. We end every week with an awards ceremony where all participants receive a medal and t-shirt. All staff are fingerprinted and background checked. Camp Directors are all CPR/First aid certified. 4 Core Sports – Campers will play basketball, flag-football, soccer, and baseball throughout the week. Camp Varsity caters to the athletic ability level of each camper including beginners, intermediate and experienced athletes. In addition to individual and group instruction, this tournament-style camp program includes skill competitions, championship games, color wars, relay races and team spirit contests. Recreational Games – In addition to our core sports we will play fun and exciting recreational games such as kickball, dodgeball, capture the flag, wiffle ball and more. 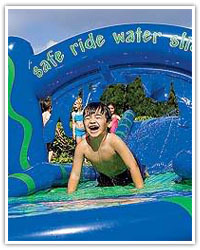 Water Sports Wednesday– Campers cool off with fun water events and a giant water slide. 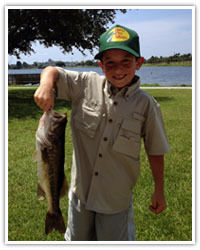 Fishing – Every week campers will have the option to fish at least 2 times per week. They will learn how to tie different fishing knots, bait a hook, water safety and learn to identify different Florida fish. We provide all fishing rods/reels and bait and tackle. Let’s kick off the summer with fun basketball activities and games all week. End of week game and 3 point contest followed by an awards ceremony. Campers will participate in different Olympic sports throughout the week. Color war competition all week. Olympic ceremony at end of the week! Participants will learn how to tie different fishing knots, bait a hook, water safety and learn to identify different Florida fish. Participants have option to fish everyday. Campers receive FREE rod/reel with camp. Campers will participate in a fishing tournament at the end of the week. Join us and celebrate your favorite college team with fun games and activities all week. “July Madness” tournament Friday. Go Gators! Fun football drills, games and activities all week. Campers will compete in quarterback passing contest and “Super Bowl” game on Friday. Campers will participate in a sports scavenger hunt and learn to shoot a bow and arrow. Fun games and activities all week. Fun soccer drills, games and activities all week. Campers will participate in a “World Cup” game on Friday followed by an awards ceremony. We will wrap up the summer with a celebration of events and a closing ceremony featuring a sports obstacle course on Friday. Fun games and activities all week. We offer something new and exciting every day of camp. Friday – “Fun Friday” Pizza and fun events and awards ceremony. All campers receive a t-shirt and sports medal during awards ceremony. Registration has started and is limited so register ASAP! We split campers into 2 different age groups. Please refrain from bringing valuable items, video games, music players, cell phones, etc. We provide all fishing equipment including bait and tackle. Campers do have the option to bring their own fishing gear. Camp Varsity is located at Watson B. Duncan Middle school. Campers have access to an air conditioned gymnasium, cafeteria and classrooms. We also use 2 outdoor basketball courts, baseball field, softball field, and a multi purpose field. Your children’s safety is our #1 concern. Each morning and afternoon, your child must be signed in and out by the parent/guardian or other adults authorized. No exceptions! Authorized adults, including parents will be required to show some form of identification every day. If you arrive at camp before instructors, please wait and sign in when instructors arrive. Camp ends at 4 PM and 5:30 PM for aftercare. Please be prompt! All cancellations must be made 2 weeks prior to camp/activity. Because of processing fees, 90% of camp tuition or 100% camp credit will be awarded if applicable. No cancellations will be accepted once camp has begun. Serious injury or illness will be considered on a case by case basis.